Home roasting coffee beans provides a simple way to enjoy the aromas and tastes of freshly roasted coffees. Roasted coffee stales very quickly and is dramatically diminished in days so home roasting ensures your coffee is always fresh. It's fun and easy and takes only about 20 to 30 minutes from roasting to brewing and about half the cost of store-bought roasted beans. Green un-roasted coffee beans are easy to find in stores or on line. The Nesco Coffee Bean Roaster features a patented catalytic technology that significantly reduces smoke and odors during the roasting process. Pre-set digital controls automatically roasts and cools with the touch of a button. 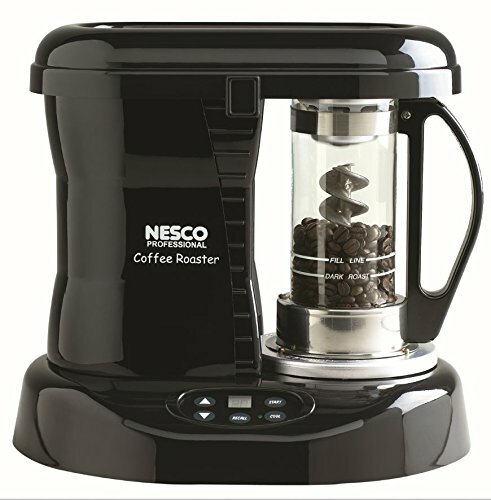 The Nesco Coffee Bean Roaster provides a superior roasting performance by combining warm air with a powerful agitator to create an even roast with uniform color throughout the roasting batch. It's large capacity is capable of roasting up to 1/3 pound of fresh green beans (about 36 cups of brewed coffee) each time. The CR-1010-PR roasts a batch in about 20 minutes at half the cost of store-bought and is perfect for true coffee enthusiasts who want the freshest cup of coffee possible.